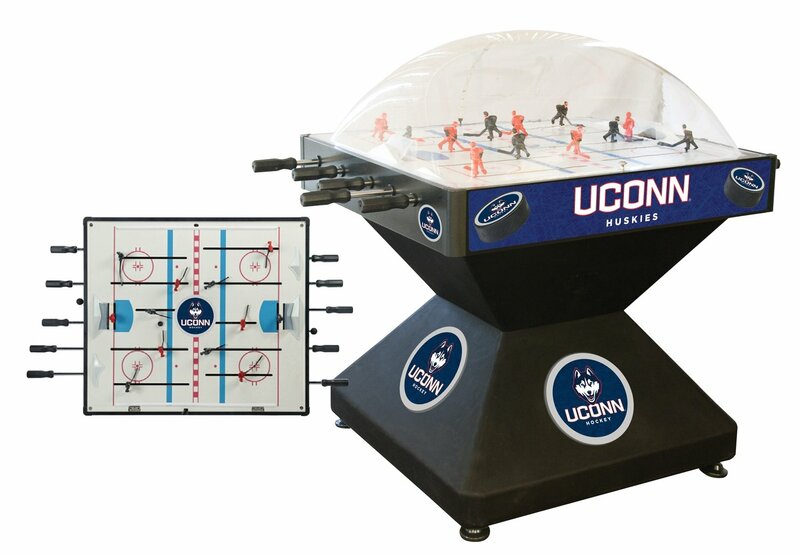 Spruce up your game room with the arcade-style University of Connecticut Deluxe Game Room Dome Hockey Table. Just like at the University of Connecticut, the fast paced game combines the thrill of ice hockey with the play action similar to Foosball. The playing field showcases the team logo on the sides and center of the ice. Built for high performance and responsive game play with a 2:1 ratio twisting action, ground and plated high tensile steel rods, sure-grip handles and clutch system preventing damage to your wrist and players when in a heated round of play. Side mounted scoring unit provides a variety of game modes. Adjustable levelers create a stable and level playing field. Not as cold as the ice, but almost as much fun. SPECS Dimensions: 54" long x 36" wide x 46.5" tall Weight: 205 lbs.